Once upon a time licensed video games—ones based on movies, TV shows, or other popular series—were the domain of festering bargain bins and well-meaning grandparents who didn't know any better. Now Middle-Earth: Shadow of Mordor and Alien: Isolation are two of the year's most interesting games. This is a good thing. There have, of course, been a handful of smartly innovative licensed games over the years. Chronicles of Riddick: Escape from Butcher Bay comes to mind as a classic, and the Batman: Arkham [Insert Person, Place, Or Vague Prequel Word Here] games elevated good ol' Bats out of gaming's gutter and into combat system superstar-dom. And hey, there was that King Kong game from a while back. It, um... it tried. By and large, however, game makers have been content to churn out bland carbon copies of better games coated in the rotten, blood-caked skin suits of familiar series. In no particular order, hello there Aliens: Colonial Marines, Catwoman, Fight Club, most Spider-Man games that aren't Spider-Man 2, most James Bond games that aren't Goldeneye, a ton of throwaway Star Wars games, and of course a heap of mediocre Lord of the Rings tie-ins. On the latter two series, the Lego games at least provide a nice (if extremely simple) alternative. Two great big-budget licensed console/PC games in a couple weeks, though? That means something. Or at least, I'd like to hope it does. Granted, awful licensed games are hardly a thing of the past (go search the iOS App Store or Google Play if you want to cringe until your forehead caves in), but I'm actually pretty optimistic about what this sudden change in approach to classic series represents. For one, games like Shadow of Mordor and Alien: Isolation give their respective series their own identities in video games. Before, both series were heavily reliant on their respective movies and—in the former's case—books to lend their games value and meaning. Without that crucial context, without an affection born of previous experiences with experiences that were, you know, good, they didn't matter. The games were just piggy backing, typically on a movie release around the same time. Both Shadow of Mordor and Alien are cool because they're games—not in spite of that fact—and they're not reliant on any particular film release either. Mordor is this great systemic sandbox, this boiling cauldron of orcish tensions that spill out into messy, unpredictable battles. Sometimes it makes you feel like a badass, other times it makes you laugh. Heck, I even feel things about the orcs that populate my game on occasion. Hura Skull-Collector might have been a total jerk who wouldn't stop stalking me at the worst possible times, but damn it he was MY total jerk who wouldn't stop stalking me at the worst possible times. He was so determined. It was adorable. Don't get me wrong: I hacked his face to ribbons so many times that he ended up taping it back together with a greasy burlap sack and string, but we had a bond, he and I. I decided to let him live, help him grow more powerful. Truth is, he sucked more than most orcs. He was so bad at everything. Eventually (and improbably), though, he ascended to Warchief status with my "help." I was so damn proud. He's one of my favorite characters in all of Middle-Earth now. In a series swollen with a preposterous number of stories, appendices, spin-offs—dating all the way back to the 1930s, he takes the, or at least a, cake. An orc. That a computer made for me. Madness. Alien is a little different and, admittedly, more directly connected to the movies' characters and world, but it nonetheless lives and dies (and murders you a whole, whole lot) on the fact that it is a video game. There aren't any jump cuts or strategic pans or whatever. You watch and wait and hopefully please, please, please avoid the Alien in real time. You sit in your own head, stew in the sweat stink of your fear, as you try to scurry away from its acid-soaked web. After years of sequels, spin-offs, and pop culture jokes defanged it, Isolation makes the Alien scary again. That is no small feat. Arguably, it's something only a new medium that offers new tools and opportunities can accomplish. It is, in short, really friggin' cool. This sort of thing has a way of paying itself forward for video gaming as a medium, too. Good, intelligent video game innovation reaching more eyeballs because it's attached to familiar names and faces? That's great, especially in big-budget gaming where innovation is upsettingly rare. Admittedly, both Shadow of Mordor and Alien draw on a bunch of tropes from other games themselves, but they deftly pair the old and the new, and they do it in a way that fits their respective universes nicely. Moreover, there's a good chance other games and series will iterate on these games' innovations. 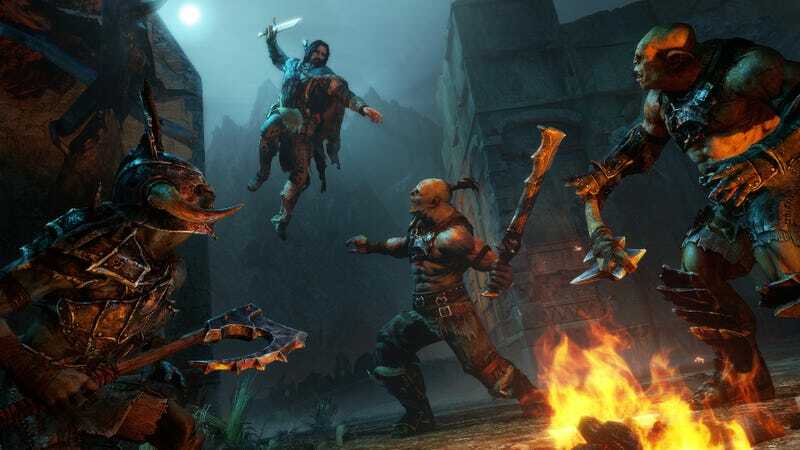 Combat systems that draw on what Arkham Asylum pioneered show up everywhere now—including, unsurprisingly given that they're both WB games, in Shadow of Mordor. I can't wait to see what other people do with randomly generated enemies ala Mordor and more intimate, confined enemy encounters like in Alien. I think there's tons of possibility in both cases. Granted, neither of these games is perfect. Alien can be janky/frustrating in places and Mordor's story is alternatively bland and kinda messed up (in a way that makes me wish a big series would come over to games a little less reliant on violence, if only to see what kind of stories we'd get), but this is an encouraging trend overall. Can I call it a trend? Is it really a trend yet? I don't actually know. I think there are encouraging signs pointing to it becoming a trend, though. Again, the Batman: Arkham series is spoken of in revered whispers, both in terms of mechanics and sales, and I think it says a lot that both WB and Fox/Sega decided to put Alien and Middle-Earth in the hands of capable studios rather than small-timers who just need to make a quick buck. Meanwhile, Legend of Korra is getting a game from the grandmasters of combat action at Platinum and Telltale's made an entire business out of crafting cinematic tales in universes like The Walking Dead, Fables, and now Game of Thrones. I'm sure I'm forgetting a few other examples too. Despite a still-overwhelming number of not-great licensed games (especially when you count the mobile game scene), things are looking up. I'm hopeful. That's not something I've really ever been able to say about games like these. Now then, who wants to take a stab at making a new Buffy The Vampire Slayer game already?